This post is a quick introduction/reminder about internationalization (i18n) in Java. The code examples are available from GitHub in the Java-Internationalization directory. Displayed text - Proper text according to user language. Dates - Formatting, for example month, day year, or day, month, year? Currencies - Using a comma or a dot as a separator? number of significant digits? Localization is the process of adapting displayed text, dates and currencies to a country, region or language. Java defines the Locale class, which represents a language, and eventually a country or region associated to it. 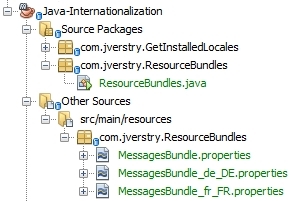 ResourceBundles are created by providing a Locale. They contain objects and strings internationalized according to the provided locale. Notice that one must provide the "package path" to load the property files. In an earlier post, we have already described how to format currencies. More Java related posts here.